How to Record PowerPoint 2016? step 1: First of all you need to open PowerPoint on your system and then go to recording tab. There you will find record slide show option in the drop down menu. step 2: There are two options available to initiate recording: either you can choose to record from current slide or prefer to initiate recording from beginning of your slide show. Choose the one you need for your project. step 3: Once you have selected the recording option then the slideshow will open in a presenter view where few useful buttons will be available on screen. On the top bar at left side you will find start, stop and pause button. If you are ready to begin your recording process then hit the red button on top left corner. Few navigate arrows are available on your screen that you can use to move your slides to previous and next point. A pointer tool can be also selected. step 4: When you have completed your recording process then you simply need to right click on your last slide and then from drop down menu simply choose end show option. 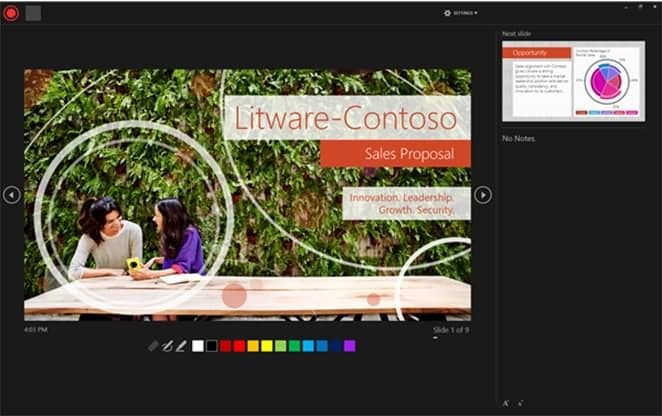 How to Record PowerPoint 2013? Use this button to move to the next slide. Use this button to pause your recording. If you want to re-record the current slide then use this round arrow from toolbar. 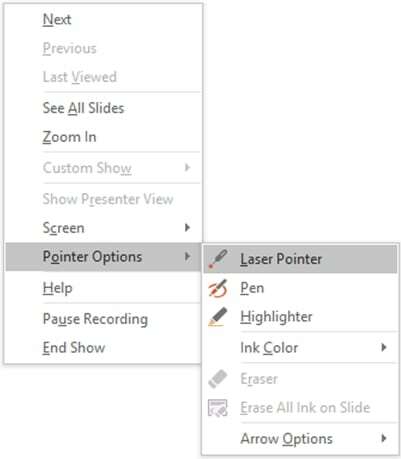 In case if you want to use pointer then simply right click on the slide and choose the pointer options from available tools in drop down menu. Rest of the recording steps will be same as that of PowerPoint 2016. How to Record PowerPoint 2010? step 1. 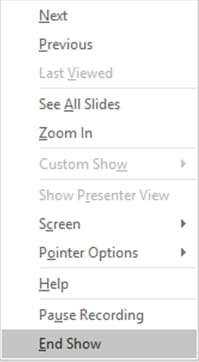 Open your PowerPoint 2016 software and the specific slide show that you want to record. step 2. Now go to the slide show tab and from there choose option “Set Up Group”. Now hit the option showing record the slide show. It will be represented by symbol . Either you can start recording your slide show from beginning if you wish to create a complete tutorial. Or you can initiate the recording process from current slide. So choose your option as per need. step 4. Go to the Record Slide Show dialogue box and then further select Narrations and Laser Pointer from available check box. If everything is okay then further you can select as well as deselect Slide and Animation Timings from check box. step 5. It is time to hit the button “start recording”. step 6. When your recording is complete then simply right click on last slide and choose end show option from menu. How to Record PowerPoint 2007 and 2003? step 1. Go to Slide show tab on your software and then visit Set Up group option, hit the record narration option. step 2. Set Microscope level as per need and then hit Ok.
Embed narration – Hit Ok.
Link Narration – Select link narration option from check box, click on Browse option, choose the folder from the list and finally select. It is good to use same folder where your presentation is saved. step 4. Now start recording your slide show, the pause, resume etc options are available on screen. step 5. Once complete then hit the Exit Button.